I wake up around 6:30 a.m.
Got out of bed, showered, got dressed. Decided to try out De Dutch. I’ve never been to one before. There was one that opened up down the street from me when I lived in Victoria. That seems like a lifetime ago but it’s been little more than a decade. I tried to go there once but there was a long line-up to get in so I left and never tried again. No line-up here. Or queue, as the British say. Isn’t it weird that over in England, they speak the exact same language that we speak but it’s almost an entirely different language altogether? That’s mad. A blonde waitress greets me and seats me. As she walks away, I can’t help but notice that she has really nice legs. I’m a leg man so I appreciate this more than most. From here on out, I will refer to her as Legs. So Legs comes back and asks if I would like something to drink. I ask for orange juice. While I wait for my morning drink, I peruse the menu. A lot of options, I can’t decide. I finally decide to get DeBakon and Eggs. It’s self-explanatory: it has what it says plus toast and hashbrowns. Plus your choice of salad or fruit. I tell Legs that I’ll have the fruit with my meal, even though I’m pretty sure I won’t be eating very much of it, if at all. Well, I told her the first part. The rest was what I was thinking to myself. I’m not really a big fruit/veggie fan. As I’m waiting for my food, I’m browsing on my phone. Intermittently, I watch Legs go back and forth serving other people. There’s other waitresses working but she’s the most interesting. My order comes and I dig in. It’s fairly straight forward, with the exception being that the bacon is not in strips like we’re used to eating. They’re in thin, circular slices but otherwise taste about the same as regular bacon. I finish my breakfast, pay Legs, then leave. I drove this time, only because I knew I was going to be driving around town most of the day. Before going anywhere, though, I decide to take a test run out to the arena where I’ll be watching Alice in Chains tonight. My trust level in my TomTom is not at an all-time high so I want to test it and see if I get there on the first try. I set the coordinates and drive off. I know the arena is a little ways out of the downtown area but not too far. TomTom tells me that I’ll get there in about five minutes. That’s, of course, if I get there at all. I’m following TomTom’s directions and get closer to the arena. I make a right turn then a left and find myself outside of a parking lot. I see a sign that says: Parking $3. What? I don’t want to pay for parking, I’m not planning on staying for whatever’s going on here. Am I in the right place? There’s two lanes so I pull into the left one hoping It’ll lead me out of here. It doesn’t. I’m caught in a trap, I can’t walk out, because I love you too much baby. I pull up to a checkpoint and a lady hands me a parking pass. I don’t have to pay for it and as I drive through the parking lot I see what’s going on. I’ve inadvertently driven into the BCNE: the British Columbia Northern Exhibition. This is not what I want at all so I look for a way out. I follow the arrows and drive down a dirt road that takes me past the front of the CN Centre. So I am in the right place after all. I just didn’t know there was a carnival happening outside of the arena. I pull into another parking area and decide to get out of my car to take a look. I see a car that’s coming the same way I was, only it turns left just before the parking lot that I’m currently standing in. I watch as it drives to the end of a driveway, turns and exits. So that’s my way out. I jump back into my car and set new coordinates for Pine Centre Mall, a place I discovered accidentally last time I was in PG. It has a lot of stores. Target, Coles and Sears are of particular interest to me. When I get there, I realize it’s still early, around 10 am. Is anything open yet? I drive around to the back entrance of the mall, the parking lot’s pretty much deserted which isn’t a good sign. I try to do a Google search on my phone to find out if the mall is open yet. My phone’s slow, been that way a lot lately. While I’m waiting, I watch as other people pull in. One guy goes up to the doors, pulls on the door and walks in. Looks like it’s open. I get out and as I get to the doors, I see that it doesn’t actually open until 11 a.m. I decide to go inside anyway and see if anything’s open yet. Nothing’s open but I wander around to see what stores are here. I didn’t get a chance to explore last time I was here so this is a good opportunity. It’s a weird feeling walking through an empty mall with no stores open. It feels lonely though I’m not the only one wandering around. Why are other people here? The same reason I am? Killing time until the mall opens because we didn’t check before we left early this morning? There’s nothing here that really catches my eye and I’m getting bored so I leave. There’s a SportChek beside the mall that’s open so I decide to go in and kill some more time. Time goes by so slowly when you’re waiting for a mall to open. I have measured out in my life with coffee spoons. I wasn’t planning on buying anything but as I wander through the store I find an Adidas jacket and a Vancouver Canucks shirt that I want so I buy them. It’s still not 11:00 yet but I decide to drive over to the other side of the mall. Turns out Target’s already open so I walk in. Normally, most place I shop in, I get a basket but I get a cart as I know I’m going to buy a lot here. I start off in the stationery section. Last time I was here I bought some Moleskine notebooks, I liked them so I want to get some more. I buy some small ones and some medium ones. The pen that I’ve been using to write travel notes with keeps overflowing so I look for a new one. I decide to try some Paper Mate Ink Joy pens. From there I go to electronics and look at Xbox 360 games. They have Arkham Origins on sale for $10. There’s no way I can pass this up so I grab it. I have the first two Arkham games and I’ve been looking for the third one so this is a major score since it’s normally at least $50. I don’t play video games very much anymore. In fact, I bought Arkham Asylum about 6 months ago and I’m still not finished it. I don’t know when I’ll get around to playing Origins but I’ll play it one of these years. That’s kind of a pet peeve of mine: so many games have such long single-player campaigns that it takes me forever to get through them. Oh well, let’s call this an investment. Next I go to the clothing department. Last time I was here I bought some Haggar pants and I liked them a lot. Problem was, one pair that I bought were a little too small as I bought the wrong size. I get the same kind in the right size and another pair of a different color that I didn’t see before. I also buy a straw fedora as it’s pretty warm here in PG and my felt fedora is a little too hot to wear. After I pay for my stuff and put it all in my car, I notice it’s getting close to lunch time and I know there’s a McD’s nearby so I decide to go across the street to eat. After eating, I walk back across the street and continue shopping. The thing is, it’s getting even warmer out. I’m getting a bit of a headache and feeling a little dehydrated. There’s a Shopper’s Drug Mart right beside Target so I go there, get some Tylenol and look for something to drink with it. I’m about to get some regular water but for the hell of it, I look at what else they have. 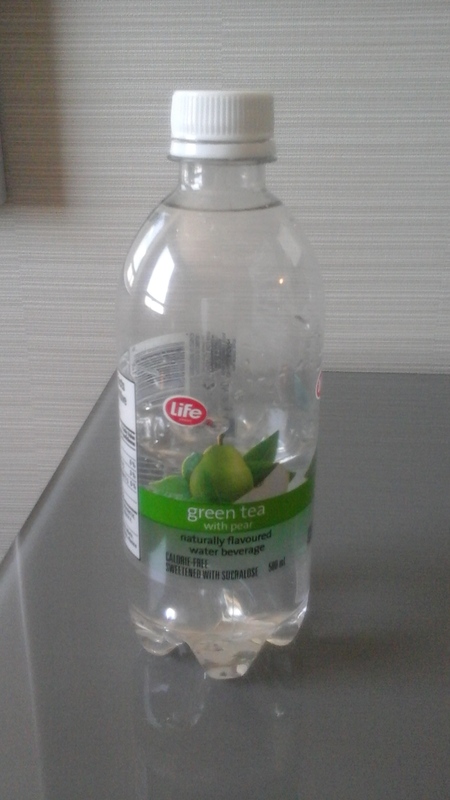 I spot some flavored water, one of which has green tea and pear flavoring. That’s unusual and it sounds good so I buy it. I get out to my car, pop a couple of Tylenol and take a drink of the flavored water. Holy Christ, it’s good. Surprisingly so. Normally flavored water is just that: water with a tiny bit of flavoring in it so it tastes like watered-down Kool-Aid. This actually has taste to it. Maybe it’s because I’m thirsty but I think this has become my new favorite thing. Next I go to Sears. I look around but don’t buy anything. From there I check out Cole’s book store. I buy a book called The Jedi Doth Return. It’s a re-telling of Return of the Jedi but it’s written in the style of Shakespeare. I have the first two books and I’ve been looking for this one. I also buy Fight Club and Choke; both are novels written by Chuck Palahniuk and both were made into movies. I’ve seen both but have never read either of the books so that’s why I decided to get them. It’s late afternoon by this time and I need to eat and get ready for the concert. The question is, where? I could go to Wendy’s again but I decide to try out this Daddy-O’s place. I have no idea where it is so I look up the address, punch it into my TomTom and drive off. Things are okay until I get close to the place and my GPS tells me to pull a u-turn. Uh, what? I’m pretty sure that’s illegal and it would just be a bad idea at a busy intersection like this one. I defy my GPS once again and try to find the place on my own. I drive around in circles and don’t find it. To hell with this. I saw a McD’s on the corner so I go there. After eating, I have a feeling that I’m close to Daddy-O’s so instead of driving, I decide to try and find it on foot. After crossing to the other side of the street, I walk past a motel and there’s the place. No wonder I didn’t see it, the place is facing the opposite way from where I was driving. I actually did drive past it but it was hidden in a horseshoe configuration of buildings so I never saw it. Well, that solves that mystery. It’s too late to go there now, I just ate and it’s getting closer to show time and I need to get ready. So I walk back to my car, drive back to my hotel and prepare myself for Alice in Chains.